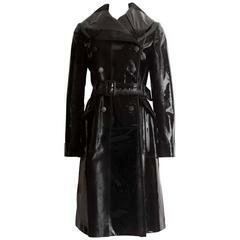 This is a great vintage Alaia long trench coat style raincoat with waist belt. This double breasted designer rain jacket has side slit pockets and can be worn buttoned all the way up, or with the lapels out. It has a pleated slit running up the back to the waist, that can be buttoned closed or worn open to increase movement. It is made of 100% nylon with a silky feel and slightly iridescent finish. The belt is a fabric tie of the same material, and can be cinched as tightly as the wearer requires! 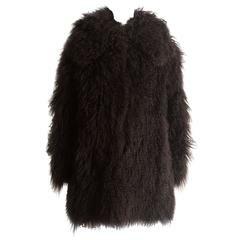 It is marked as a size large, and has a great oversized fit. Made in France. BUST: up to 56" SHOULDER: raglan SLEEVE from underarm: 18" LENGTH: 52"
Alaia Mongolischer Lammmantel mit übergroßem Kragen, Klettverschlüssen und zwei Fronttaschen.